I finally got my hands on a Google+ invite and have been glued to this new social network for days. I'm sure a lot of you know about this attempt to make the next big social networking site powered by Google. If you don't, well, you do now! The easiest way to describe G+ is by calling it a nicer designed, more in tune with the user Facebook that has a presence of Twitter scattered throughout. Before I even joined, I already loved it more that Facebook because of the simple fact that it's created from the ground-up by Google. Lately, Googles been doing a total overhaul on everything from Gmail to Mobile Search. The overall design of these has been great, and play better with the users than they ever did before. 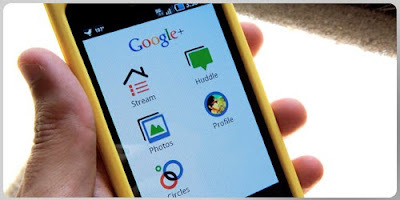 Google+ has been nicely placed in with all of these current Google products. It's now as simple as clicking the "+Joshua" at the top of my Google pages and I'm instantly in my social profile. Once in the belly of the beast, there's a nice feed that we've grown fond of in every other social media site. This feed is different though. This feed allows you to filter through and find what you actually want to read by using "Circles". Circles are basically a way of grouping everyone that connects with you online. Friends, family, acquaintances and anyone else. I have "East Coast Friends", "West Cost Friends", "Designers", and a few other Circles. Not only can you filter your feed with these, but you can choose what Circles will see what posts of yours WHEN you post something. No more mass invites that open the door to people you don't want coming on your next camping trip. And no more embarrassing comments on "cool" posts from your family (haha, not that my family does, but I've seen some people who have relatives that shouldn't be on social media). The Circles go even further, you can do group chats (text and video), event planning, custom photo sharing and spark creative conversations with those who actually need to be in said conversation. 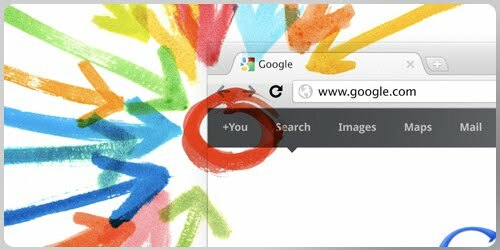 Circles aren't the only thing though, there's other features on Google+, like automatically linking everything from Picasa photos to YouTube videos on your channel for you to quickly share when you want. Custom sharing seems to be the biggest thing with G+. Gone are the days of mindless mass-posting and senseless interaction, because you can decide who sees what post, photo, video and link. ​The mobile app for G+ is actually 1000x easier to use than Facebooks app. Right now the Google+ app is only available for Android (kind of dumb if they want this to really take-off), but there is an iPhone app in development. There's also an easy to use but limited mobile site that works ok in iOS Safari. Back to the android app: it's amazing! 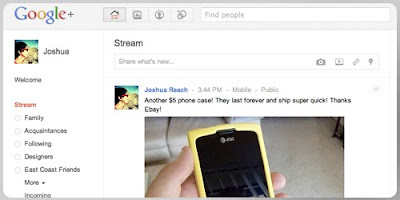 Simple, clean, easy to navigate and basically puts the entire G+ experience in you pocket. Only complaint with it though: no video support. I can't view my Picasa videos on my Flash enabled Galaxy S phone. I'm sure this will be fixed once the site comes out of Beta testing. Limited video isn't a deal breaker though. You can tell Google put a lot of thought behind this whole project, especially the mobile app. Out of all of this love for the Google, I do have one complaint; it needs to be opened up to more people. If you're going to promote the hell out of something like this, make sure your servers can handle millions of people. Thanks to my friends for getting me hooked up with an invite (especially @Zulkirs), but it should not have taken a week of fighting and failed attempts to get me linked up. Once I was on, I realized...there's only 4 of my friends actually actively using Google+. Where's the fun in that?! I tried for the next few hours to get friends on-board, but there were no open invites. Finally, yesterday, they opened up invites and we all started handing them out like candy. So far, invites are still open, so if any of my friends, family or acquaintances want to join, let me know by emailing me at: josh [at] reachcreations [dot] com. I want more of YOU on so this site can really start being more entertaining. Those of you who are on but not actively posting or interacting; get your act together! It's only as much fun as you make it. This entry was posted in mobile, review, social media.